Classes that bridge from English class to higher education and/or jobs! Future classes will depend on the interests of our students. Many students find these classes helpful for their job search. If you are interested in finding out more about these classes, contact Peg Johnson at ﻿pegrj@cnam.org﻿. 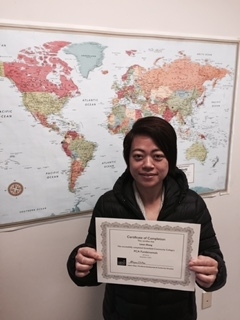 Li Mei, Bridges to Healthcare Jobs student, with her Personal Care Assistant certificate.